The United States is one step closer to eliminating its reliance on Russian technology to launch its military satellites. The Hydrocarbon Boost Technology Demonstrator, a U.S. Air Force technology effort focused on development of Oxygen Rich Staged Combustion rocket engine technology, has recently completed its first full-scale component test at 100-percent power. The development of Oxygen Rich Staged Combustion technology has been deemed a critical technology for the nation to help eliminate the United States’ reliance on foreign rocket propulsion technology. The testing was performed by Aerojet Rocketdyne under contract to the Air Force Research Laboratory Rocket Propulsion Division, nicknamed the AFRL Rocket Lab. The HBTD’s kick pump is the first full-scale component to commence testing. The AFRL Rocket Lab recently completed the test campaign of HBTD’s sub-scale preburner at its test facilities at Edwards Air Force Base in the same historic facility that tested the F-1 engine for the Project Apollo Saturn V program and RS-68 engines for the Delta IV expendable launch vehicle system. The kick pump was tested at Aerojet Rocketdyne’s facility in Sacramento, California, which has been used continually through Titan missile, Apollo and space shuttle programs. The kick pump is a complex turbopump assembly made up of both a turbine and pump, hence the term turbopump. It is designed to be extremely compact and rotates at punishing speeds to meet extraordinarily high efficiencies required for space access, even down to one-third of engine power levels – a severe challenge for current state-of-the-art turbopumps, system designers say. The kick pump operates in excess of 75,000 rpm at its 100-percent power level. The component is a critical element of the engine as it “kicks” a vital portion of fuel up to the extremely high pressures demanded by other engine components, without requiring the engine to pump all the fuel to that pressure. This drastically reduces the size, weight, cost, and complexity of the engine. The implementation of this kick pump in an ORSC engine provides for a performance improvement compared to other foreign engines, such as the Russian RD-180. Phillips added that this test effectively achieves the harshest test point of the kick pump test campaign. The sheer number and duration of tests is beyond that of typical test campaigns for development pumps and is an example of the technology push and intense research focus of the HBTD program. As the campaign progresses, the kick pump will be pushed to its limits, testing the pump’s efficiency and potential life of the bearings and seals. These tests will provide data from 113 instruments that will continuously monitor the pump’s health during operation and allow engineers to directly measure parameters that would otherwise need to be determined analytically. This is one of the most highly instrumented turbopumps of its size ever developed and will provide critical data to the full-scale demonstrator engine test campaign, Bernstein said. The demonstrator engine will integrate the kick pump with other full-scale components like the main turbopump and preburner for integrated powerhead testing. 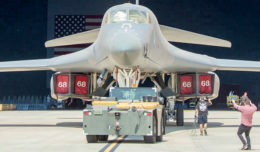 “The massive amount of data we’ll be collecting will validate some key technologies and help us reduce risk for the full-scale, demonstrator engine,” said Bernstein. The demonstrator engine’s full-scale components are designed for 250,000 lbf of thrust and a throttling range of 33 to 100 percent, eclipsing the performance and efficiencies of domestic and foreign rocket engines of today. The testing of the full-scale components will help the U.S. rocket industry understand one of the most challenging rocket engine technologies ever developed and are intended to achieve the ambitious goals of the Rocket Propulsion Directorate for the 21st Century (RP-21) program, said Bernstein. 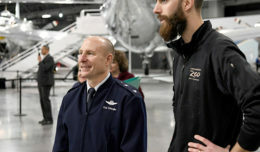 This activity will benefit the Air Force and the nation by demonstrating the viability of key technologies and materials necessary for this cycle while making available the design and data to all of the American aerospace industry he said. The lessons learned from the HBTD program are vital to maintaining America’s superiority in rocket and space technology, Bernstein said.